This November, get ready for climbing’s greatest stories, stars, and sends. REEL ROCK 13 premieres new short films that will deliver heart-thumping action, big laughs, and pure inspiration. Brought to you by UC San Diego Recreation - Outback Adventures and Outdoor Outreach. $1 from each ticket sold goes to Outdoor Outreach. This screening will be held at the Giant-Screen Theater in theNat-San Diego Natural History Museum. 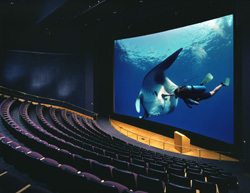 The Giant Screen Theater delivers a premium viewing experience from anywhere in the 300-seat, stadium-style theater. Numerous restaurants and bars are within walking distance of the venue. Concessions and beer/wine will be available for purchase. This is an all ages show. Parking available in Balboa Park lots. Doors open open 30 minutes before the show. Print your ticket at home for entry. To enter the venue with a UCSD student ticket, YOU MUST BRING YOUR UCSD STUDENT ID. * Tickets are non-refundable. Tickets are transferable. Based on availability, tickets can be exchanged for a different Reel Rock screening hosted by UC San Diego.